William H. Seiler, "Magazine Writers Look at Kansas, 1854- 1904," p. 1. Peter H. Argersinger, "The Most Picturesque Drama: The Kansas Senatorial Election of 1891," p. 43. Joseph G. Gambone, ed., "Kansas--A Vegetarian Utopia: The Letters of John Milton Hadley, 1855-1856," p. 65. Bypaths of Kansas History, p. 235. Kansas History as Reported in the Press, p. 237. Poets have long enjoyed license to rhyme as they please, landscape painters to move objects about for better balance, and cartoonists to accentuate the obvious. 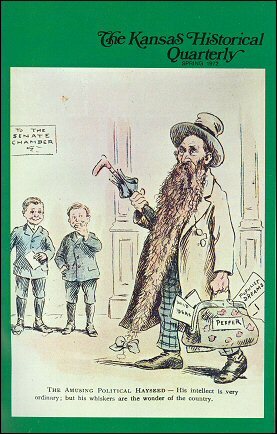 And so it was with Puck artists who delighted in sketching Kansas' U.S. Sen. William A. Peffer wearing whiskers longer than was his custom, as in this drawing, published under a copyright date of 1895. Other sketches are reproduced between pp. 64, 65.